icotek Smart Cable Management - A wide product range of patented cable management solutions for a variety of application areas. Unitronics VFD Line- Seamlessly integrate Unitronics VFDs with their UniStream, Vision, and Samba PLC + HMI All-in-One controllers for faster, easier drive setup and maintenance. WERMA - Setting the standard for modern, networked, intelligent signaling with products that keep processes safe and running efficiently. Line includes signal beacons, traffic lights, horns, sirens and optical-audible combinations. 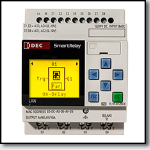 Data Acquisition Systems - Powerful protocol conversion and data acquisition capabilities to unlock valuable data from orphaned or legacy equipment. M611 Mobile Printer- Durable printer-from-everywhere solution featuring a quick, intuitive and connected mobile app combined with mid-volume industrial printing. BradyPrinter i5100 - High volume smart printer for everyday high-mix printing featuring an intuitive touchscreen. Replacement for the IP300. Mencom - Mencom Corporation provides high quality, cost-effective solutions that meet industrial electrical connector requirements. 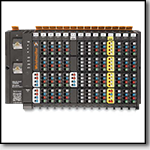 Their product line includes M12, M8, molded cables, Panel Interface Connectors, Ethernet solutions and more. 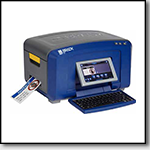 Cembre | MG3 Thermal Transfer Printer - Print 50% more terminal tags per one ribbon with this plug and play identification printer. Weidmüller | Lighting Solutions - Industry light with an IP67 aluminum housing that can withstand harsh environmental conditions. DEHN | DEHNpatch Outdoor- IP66 rated, waterproof Ethernet/PoE enclosure. ABB | Push-in Wiring- Industry’s first range of motor starting solutions with a Push-in Spring technology. 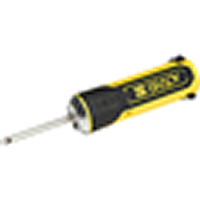 Brady | QuickSleeve Applicator- Intuitive multi-tool that is designed to help quickly apply sleeves on to wires. 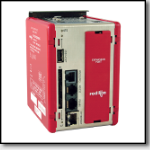 Red Lion | NT24K PTP and Security Upgrade - Updates to the NT24k Ethernet switches enable PTP and offer increased network security. T&B | Explosion Proof Enclosures - New, full line of explosion-proof enclosures for use in hazardous and adverse environments. 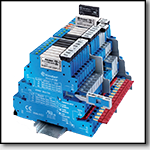 PULS | Redundancy Modules - Three new 20A, dual input redundancy modules.